I keep saying I want to keep this blog up to date, and then I go do something else. Anybody else have that problem? Well, alas, here I am to show you some of the things I’ve been doing this past year. Where do I start? Ok, I have been wanting to do a Casey quilt for the past two years. We lost her almost three years ago to old age I guess. I just know Rich and I both mourned her for over a year and still miss her so much. But it took me until now to be able to make this art quilt. So here is “Casey – The Best Dog Ever”. 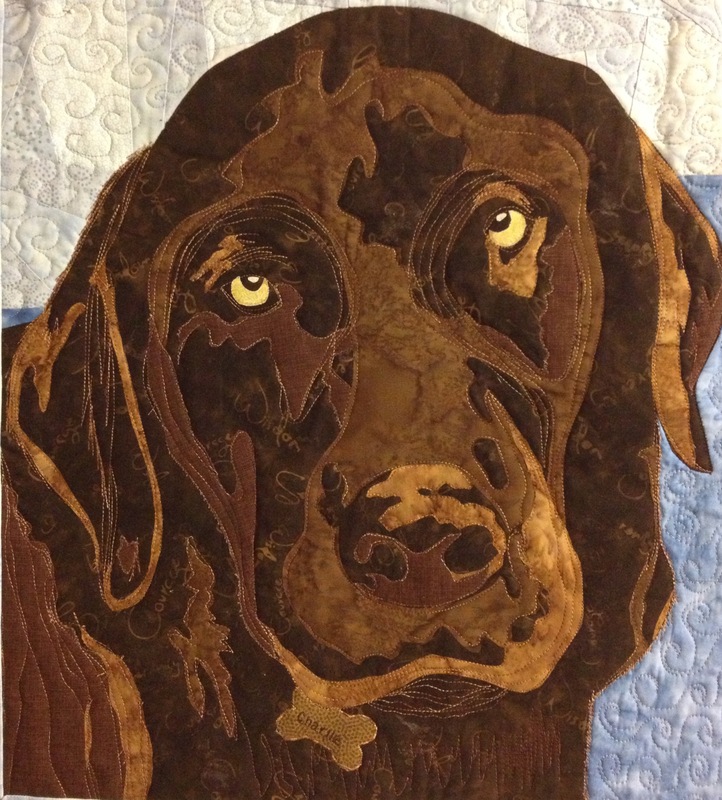 She will be traveling to Des Moines, Iowa, to be entered into the AQS, American Quilt Society, show in October. I also made a quilt from a photo I took a couple years ago of a dahlia in my front garden. I have been in love in dahlias since I saw a dinner plate dahlia in Victoria, BC, at Butchart Gardens. Have you ever seen a dahlia that is 10″ in diameter? It’s just mesmerizing. You just can’t believe you’re really looking at a flower that big and perfect and beautiful. So this is a closeup of a white dahlia I took a picture of, but it was really only about 5″ in diameter. This quilt was judged into the Pacific Quilts International Festival last year in San Jose, and will be shown at Road to California with a special exhibit sponsored by the Southern California Council Quilt Society. I hope I got that right. The special exhibit is called “Emerging Light”. And the last thing I will show you is a 20″ x 20″ art quilt I made for a challenge from Cherrywood Fabrics. This is their third year to post these challenges and this year it is called Van Gogh. The piece must be exactly 20″ square and you have to use four of their fabrics. The fabrics this years were three shades of blue and one black. 70% of the quilt must be of the blues and the piece has to “read blue.” So I decided to do something that depicted a starry night, such as a starry night in Texas. Ya’ll from Texas know what I’m saying. I got an email today that said “Congratulations! Your quilt is a finalist in our Van Gogh show. So I’m hoping that it will be traveling from show to show for the next year or two. Here is a link to tell you more about Cherrywood and the past two shows they have had. http://cherrywoodfabrics.com. You can click on the Wicked and Lion King to see the amazing quilts that were in those shows. So earlier this year I posted three pictures of some squares I did for a collage piece. Well, sometimes it takes me a little time to really finish a piece. The middle picture in this collage is a leaf that grows on a grape vine in my back yard. I stitched it on some fabric that I printed on my home computer. I copied onto fabric a lettler that my friend Ethel sent me back in the 90’s. Oddly enough, I still have letters from her and others. I’m glad I saved them. My plan is to have some of them printed at spoonflower.com onto fabric and I can use that fabric in quilts. This leaf was from a sun dyeing day a couple of years ago. This image was on a larger piece of fabric and I cut it out and stitched it onto this fabric. The other squares on this piece are various media including water color sketching, mono-printing, sun printing, thread sketching, embroidery. It all come together and I hand stitched it together and then added a button, some bling, and an old key we found in my Mom’s house in Sweetwater, Texas. Most of you know I participate in an online fabric postcard exchange group. I send and receive handmade pieces of art from all over the world. The name of the group is Postmark’dArt and the members in this group are really talented fiber artist. So this latest exchange I signed up for the theme of flowers. I love sunflowers so I chose to do something with sunflowers. I cut out some flowers I had in a batcik fabric and raw edge appliqued one to some black fabric. Then I freehand thread sketched another flower in the opposite corner. Then, of course, there’s the bling. I love the bling. I made four different postcards similiar to this one. I took a class this past weekend with Jane LaFazio. She is such an amazing artist and a truly improvisational teacher. Because of her non-judgemental spirit I was able to create some pieces that will eventually become a cherished art quilt. Here are three small pieces that I did that will be apart of it. The grape leaf on the left was from some sun dyeing fun I had a couple of years ago using Setacolor transparent dyes from Pebeo. The grape leaf is from a grape vine that has been growing in my backyard for about fifteen years. My son Aaron planted it hoping to have his own home grown grapes. It never produced many grapes but I love the vine. The flower in the middle was also from sun dyeing that I cut out from the fabric and stitched in on top of some fabric I monoprinted on gelli plates. The blue and green leaves on the right are mostly from a sad little ginkgo tree I have in the backyard. I bought it from the Wild Animal Park about five or six years ago and it’s still only about 15″ tall. But I do get some cute little leaves from it every year and I keep thinking it will eventually grow taller. So stay tuned for the finish art quilt. I have three more pieces that I created with various methods. This is Boo. She was the much loved little dog to Shirlee Betty, a co-worker of Rich in Los Angeles. 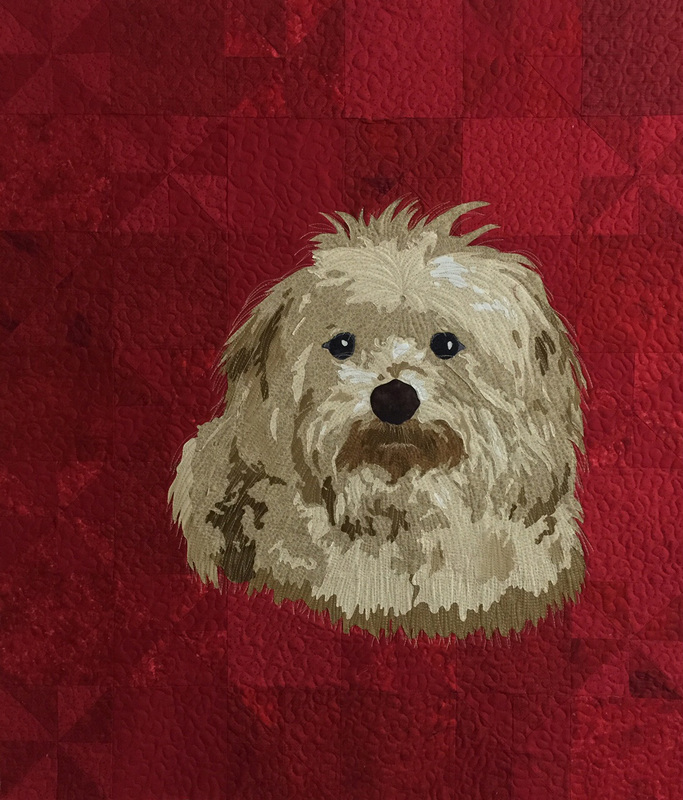 Shirlee ask me to do this art quilt of Boo as a birthday present to her husband. I sure hope he likes it. She really loved it. It was fun doing this. I felt like I almost knew her after spending almost three months making her coat, ears, eyes, month and nose. She had to have been loved so much. On the label I put this verse. “If our love could have saved you, you would have lived forever.” I think every pet owner feels this way about their furry family member. Who is Charlie? 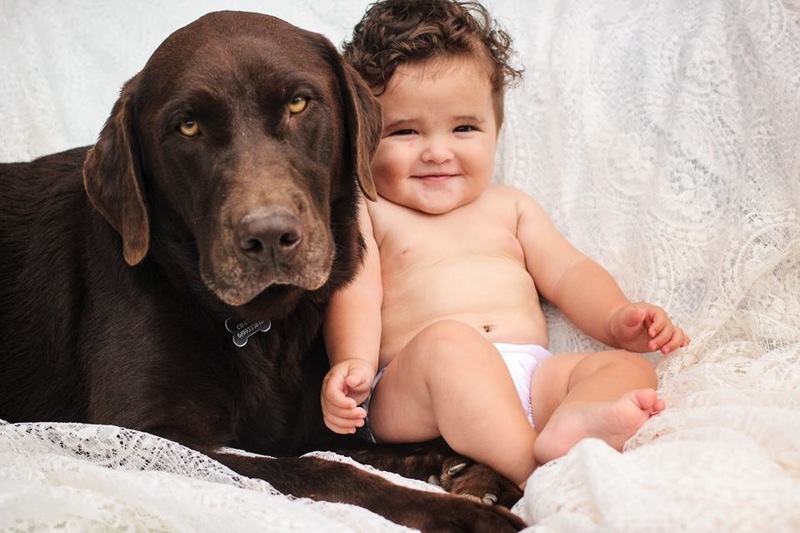 Well, Charlie is Aaron and Vanessa’s chocolate lab. That’s him on the left of the two dogs. Oh, and that’s Aaron and Vanessa during an engagement photo shoot. Charlie is a very sweet dog, but a bit goofy and clumsy. He was pretty much King Pin for the first three or four years of his life, but about a year after Aaron and Vanessa got married, along came Ezekiel. And then he was not. Ezekiel was the center of attention and Charlie knew his reign was over. So in this picture he is pretty much resigned to the fact that it’s all about the boy now. Can’t you see it in his expression? But he does love the boy anyway. So when I saw this picture I knew I wanted to do an art quilt of Charlie. He has such a soulful expression of “Whoa is Me”. Why not the baby too you ask? Well, it wouldn’t have worked as well. Also, I’m saving that baby for his own art quilt. I can hardly wait to find just the perfect picture. So here is Charlie, all by himself, with his sad, but soulful expression. I made him for an auction at Visions Art Museum back last year. The theme was something to do with chocolate, so instead of the usually connotation of yummy chocolate, I decided that a chocolate lab would be fun. What’s so cool about this whole thing is that a well known and much beloved art quilt collector, Del Thomas, bought it and Charlie is now a part of her collection. She wrote about it her blog and you can read about it if you go to her link and click on my name.